The Nebagamon Lake Association, Inc., has either been or is involved in the following projects and activities. The Association has done water clarity readings for many years. Recently, we got a grant from the Wisconsin DNR to also study water temperature, pH, dissolved oxygen, and levels of chemicals in the water. The results will help us determine whether actions need to be taken to protect the water. We are a member of the Wisconsin Association of Lakes, so we receive pertinent information from them. We received DNR grants to monitor the public boat launch area to help prevent the spread of aquatic invasive species. We have been working for several years to eradicate purple loosestrife, a harmful invasive species, from the lake and near shore areas. We provide information to our members through our two yearly newsletters and with speakers at our annual meetings. Through a DNR grant in 2005 we provided educational materials about good lake practices to all property owners on the lake, local builders/contractors, and local realtors. We provide information to others in our community through articles in the Community Association Newsletter and by making information available at the Village Board Office. Purchase, install, and maintain the hazard markers on the lake to improve boater safety. Contributed to the boat landing signs and recently purchased a new one to help raise awareness of and prevent the spread of aquatic invasive species. Paid half of the cost of the dock at the boat launch area. Contribute each year to KIN (Kids In Nebagamon). Contribute to the cost of swimming lessons on the public beach each year. Contribute to the Lion's Club for the 4th of July fireworks. Donated $1000 to the Lake Nebagamon Fire Department for a saw used in rescue operations. 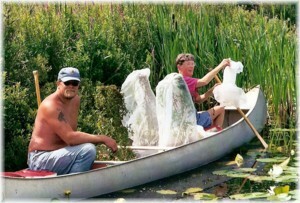 Try to improve fish spawning habitat by depositing rock and removing beaver from Minnesuing Creek. Assisted in buying new tables for the Village Auditorium. Provide gift certificates to all boats participating in the 4th of July Watercraft Parade. Donated $500 towards the village baseball field. Organize water craft safety classes for young people every year. Sponsor the village-wide garage sale each year. Participate in Summerfest and other local activities. The annual membership meeting is held each summer to socialize and conduct the business of the organization. We often have a summer social later in the summer. We enjoy working together on our projects. Click on the links below to read our Newsletters. All downloads are pdf files that require a program like Adobe® Reader®. If you don't have this type of software you can download it free by clicking on the Adobe icon below.